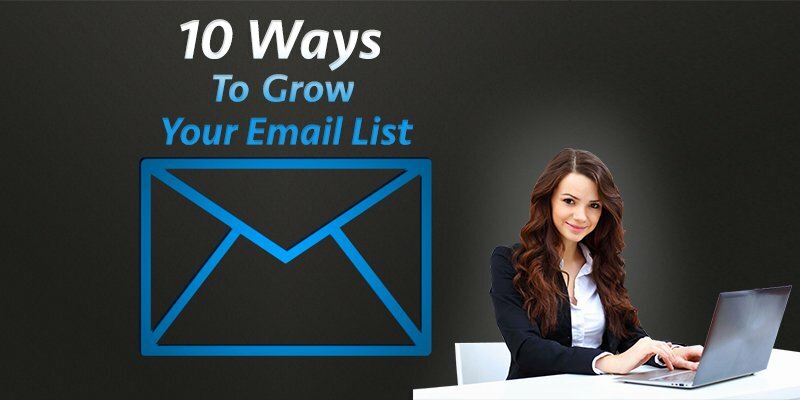 If you operate a business then you should know how important is to grow your email list. An email list is your list full of existing customers and prospects who can be converted into customers. That is why you should focus on adding subscribers to your list every single day. The bigger your list grows, the more earning power it is able to generate. This is especially important when you are introducing new products and services that you want to sell out of immediately. With a list full of buyers, you can send out an email about your latest offering and have people making purchases within the hour. In order to have a cash generating email list, you will first need to build up your email list subscribers. Every website and blog has an email subscription list, encouraging people to signup to receive great information. Therefore, you need to find a way to make your email subscription stand out so that people will actually want to receive the information you send via email. In order to build your email list, use the following ten steps that will build your list from less than fifty subscribers to thousands of subscribers. The first step in getting visitors to sign up to your email list is having sign-up forms available. You want to give people multiple opportunities to sign up to your email list while they are browsing through your website. They need to be signed up to your email list so that they can be nurtured into customers. In order to make sure people see your email subscription option, you will need to have it positioned in the most effective locations. You can have your email subscription pop up as people browse through your website — reminding them about the great value that is offered through your list. Also, You may have the signup form on your sidebars or after every single piece of content you create if you have a blog. You will want to create a call-to-action that encourages visitors to signup to your list. This call-to-action needs to state why signing up to your email list will provide great value to the individual. An individual who purchases your product or service is someone who is interested in being a long-time customer. This is a person who will buy from you over a long period of time if you continue to provide them with value. But, even though people make a purchase, it does not mean that they will automatically come back to your website to make a purchase. You will have to remind them about the latest products and services you have to offer. After they make a purchase, present them with your email subscription form, letting them know about special deals and promotions offered to your email subscribers. This will encourage people to not only signup to your email list, but to also open your emails so that they can take advantage of your latest deals. This will help to increase your online sales. If you want people to sign up to your email list then you will need to offer free stuff. Most people like to receive free stuff no matter what is being offered. They just want to take advantage of your free offering. The free content you offer should include ebooks, white papers, checklists, guides, and webinars. Just because you are offering this content for free it does not mean that it should be lacking in quality. You want to provide people with content that is so good that they wonder how great are your products and services that have to be purchased. Again, great content will encourage people to actually open your emails and purchase your offerings. Your email subscribers need to be rewarded with special offers for being a subscriber. You can give people a percentage off of their purchase, first offers of your new product or service, or free products or services in combination with making a purchase. People love receiving deals and being part of an exclusive group. Give them both and they will not only join your email list but remain subscribers to your email list. Word of mouth is just as effective in person and online. You want people to tell their family and friends about the value received in your emails. This will encourage others to become subscribers to your email list. Therefore, you want your current email subscribers to forward your emails to people who they believe will benefit from your content, products and services. As more and more people forward your emails, your list grows quickly and you have thousands of email subscribers. Do not make your email list a place where you spam people with messages to buy your products and services. This is the fastest way to have your emails tagged for the spam folder. Spam means that people want to permanently ignore your emails because they are annoying and do not provide value. Or, they may just simply unsubscribe to your list. Therefore, you need to make pitching your products and services an afterthought, and instead focus on providing valuable content. If the content you provide is seen as valuable, people will have no problem making a purchase when you send the occasional email offering your products or services. You can direct people to your website through paid traffic. Paying for Facebook ads and Google ads that are targeted towards people who fit your customer profile will help you generate a lot of traffic that you can direct towards subscribing to your email list. Your ads should be an offer for a free guide or ebook that can only be had if a person subscribes to your email list. Therefore, you want to make sure that your ad states the value being provided immediately and directs people to click on your button to learn more about your offer. Landing pages are stand alone websites where you are offering people a product or service that is free or has to be purchased. Regardless of whether the offer is free or has a price, you are going into great detail about the value of your offer. You will want to educate people about the problem that exist and the solution that is provided from downloading or purchasing your offer. Once again, the objective of your landing page is to encourage people to subscribe to your email list. This is especially true when you are offering a free download. The emails you collect from using this tactic can be used to generate consistent sales for your business. This is why every piece of content you create needs to be filled with value so that you can convert your email list subscribers into customers. Content upgrade is when you present your visitors with an offer for an enhanced version of the content they have just read in exchange for their email address. This upgrade should further go into depth about the subject and provide people with knowledge and insights that they never even considered. This will not only improve your status as an expert but will compel people to enter their email address so that they can receive the valuable information you are offering at no cost. This content that you are offering will have to be very detailed and explain the topic from beginning to end. So, only choose to go this route if you have the ability to create a very long, detailed and well-articulated piece of content. A viral pre-launch campaign is when you offer visitors free product, usually for a certain length of time in exchange for their email address. This is a strategy that is used when you want to launch your business to an existing crowd of potential customers, rather than having to desperately search for customers after the product is launched. You want to offer people a product that they really want to purchase once it is released. This will encourage them to share your pre-launch website with their family and friends who would also be interested customers. Follow these ten steps to build your email list quickly so that you can increase your online sales. You will find that the most successful online entrepreneurs have email list full of thousands of subscribers. Therefore, you want to actively build you email list so that you increase your opportunity to make more money. Remember, your website needs to encourage visitors to signup to your email list. If you want to grow your email subscribers you will need to constantly remind people that your email list exist and let them know the value it provides.